Who will be crown champion? Then the final round begins. Now is the time to stand with your teams. You need to do everything you can. Same round — new week. New opportunities to make a difference. The competition doesn't slow down. Now is no time to waste. Today's the last day of Round 3. Only a few hours left to make a difference. Don't let your teams down. The match-ups are getting more intense. in one hour round two will end. Have you done all that you could? Only 16 teams will move on. The races are getting tight. You still have work to do. Just three and a half hours left. Races are neck and neck. Glory waits for those who act. Today, fates will be decided. It's the final hours of round one. Tomorrow is the last day for round one. Round one isn't over yet. The #core64 need your help! Join us on 10/11 at @HUBweek: our #statmadness editors' pick, @TuftsUniversity, talks about using silk in medicine. 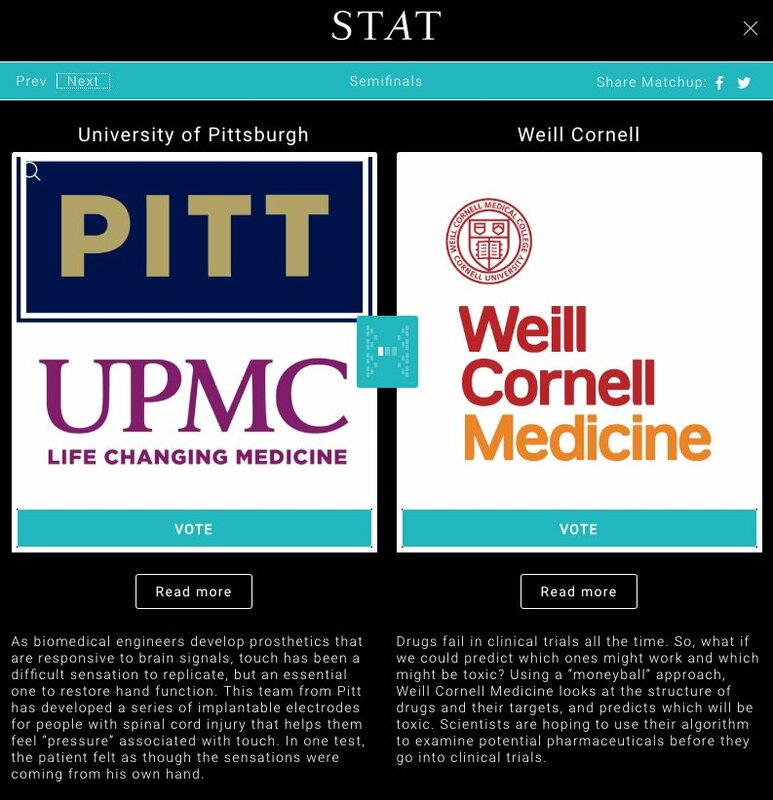 We're Twitter chatting w/ @UPMCnews & @umichmedicine about their #STATMadness entries on 3/31 @ 11am EST! Tweet your questions to #STATChat! 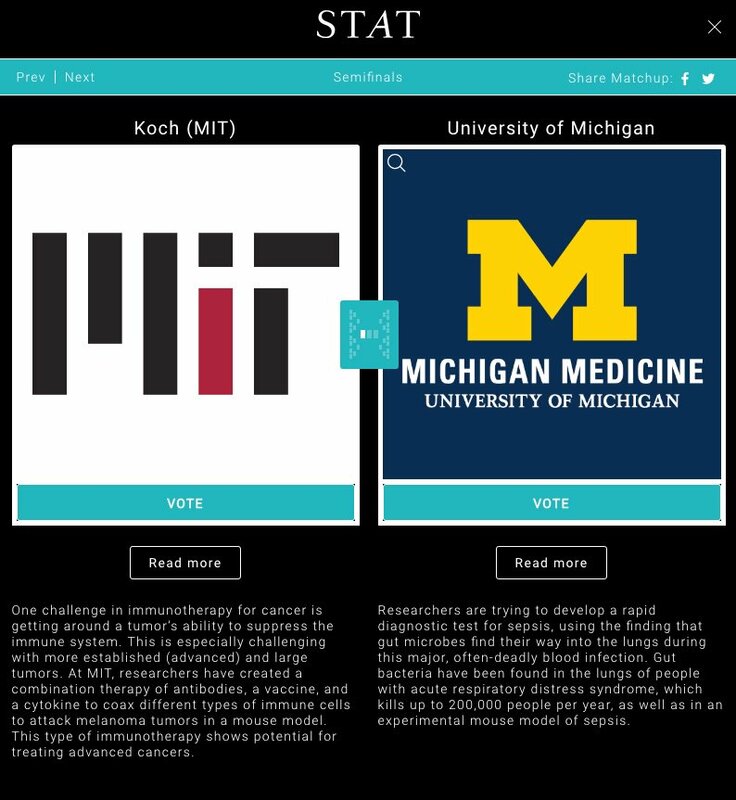 Great dialogue going on between @kochinstitute & our @robertpdickson - we may be rivals in #STATMadness but in the end science wins! This research was led by @robertpdickson who will take Qs from @kochinstitute & pose some of his own to their team. Follow #STATMadness !